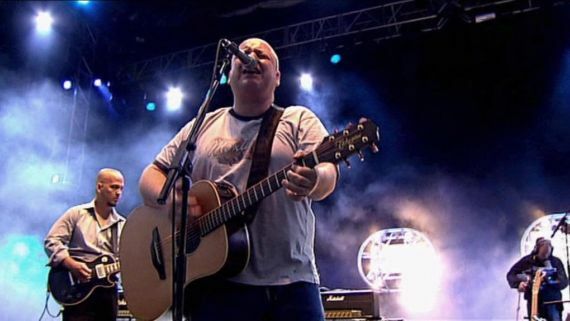 Richie writes a report from the front-lines of the Pixies 2009 tour of the UK. Anticipation. The first night in a sold out four night run at this famous London venue. Pixies are playing the fans favorite album, but not mine, ‘Doolittle’ in full including b-sides (some never played live outside of this tour as Kim Deal later tells the audience) for this the 20th anniversary of the album. Support for this night comes from fellow 4AD label mates The Big Pink. Their brand of processed guitar and Jesus And Mary Chain drumming with added synths fails to get the crowd moving. They seemed to just be playing ‘by numbers’ and not enjoying themselves. After this was the usual waiting then the lights dropped and on the screen behind the stage they projected surrealist Luis Bunuel’s infamous short film ‘Un Chien Andalou’ (the film that inspired opening track ‘Debaser’). This film includes the famous slicing of an eyeball scene, which had the crowd pleasantly surprised. All four members, Frank Black, Kim Deal, Joey Santiago and David Lovering, strolled on stage. The first song was ‘Dancing The Manta Ray’ followed by ‘Weird At My School’, ‘Bailey’s Walk and ‘Manta Ray’. By now I was wondering when ‘Debaser’ would drop and sure enough it was up next. The room exploded at the first bars of the song and we all knew what was coming next, Black’s howling, Deal’s precise plucking with her perma-smile, the sharp drums of Lovering and Santiago’s ever-calm presence. Songs ‘Tame’, ‘Wave Of Mutilation’, ‘There Goes My Gun’ et al rattled by without room for a breather. My personal standout track was ‘Hey’, the crowd almost drowning out Frank Black as he sang about whores at his door. Any ill feeling has evidently passed the band by as Kim Deal’s ever present smile told. She taunted the crowd with ‘I suppose you don’ know what’s coming, you only have a best of’ before breaking into ‘Monkey Gone To Heaven’. And like that the last note of ‘Gouge Away’ rang over the crowd and they were done. They came back out and played a slow version of ‘Wave Of Mutilation’ and a heavily dry iced ‘Into The White’. The played a second encore of three ‘best of’ tracks. ‘Bone Machine’, ‘U-Mass’ and ‘Gigantic’ were given a special airing and the crowd left feeling very pleased indeed with this fitting anniversary performance.